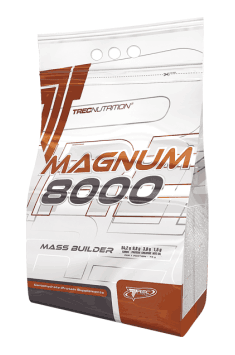 Magnum 8000 is an advanced nutritional concentrate for bodybuilders, sportsmen practicing strength sports and active persons who wish to gain body mass quickly. Carefully selected quantities of diversified carbohydrates, complete proteins and MCT oil as well as a high dose of creatine monohydrate, a component with an anabolic effect, make this product a very effective muscle mass and strength booster. MAGNUM 8000 has been supplemented with a complex of essential vitamins, which optimise the absorption and complete utilization of the nutrients it contains. Cocoa powder, Acidity regulators (Citric acid), Flavors, Sweeteners (Sodium saccharin, Sodium cyclamate), Coloring agent (Cochineal red, Beta-carotene, Ammonia caramel). An effective fat burner. Stimulates the nervous system and activates to perform activities.